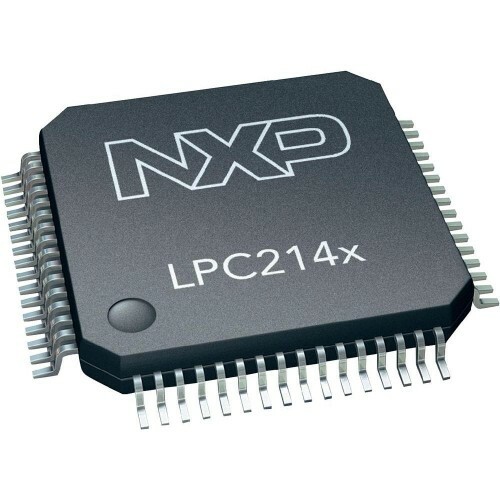 NXP LPC2148 is an ARM7TDMI-S based high-performance 32-bit RISC Microcontroller with Thumb extensions 512KB on-chip Flash ROM with In-System Programming (ISP) and In-Application Programming (IAP), 32KB RAM, Vectored Interrupt Controller, Two 10bit ADCs with 14 channels, USB 2.0 Full Speed Device Controller, Two UARTs, one with full modem interface. Two I2C serial interfaces, Two SPI serial interfaces Two 32-bit timers, Watchdog Timer, PWM unit, Real Time Clock with optional battery backup, Brown out detect circuit General purpose I/O pins. CPU clock up to 60 MHz, On-chip crystal oscillator and On-chip PLL. 32-bit ARM7 TDMI-S microcontroller in a tiny LQFP64 package.